Sharing And Growing A CNC Business On Youtube With John Grimsmo. John Grimsmo has been sharing and growing his CNC business On Youtube for several years. We have watched the growth of his company Grimsmo Knives through his many Youtube videos. Grimsmo started building his business with less than $5000 in equipment and grew it into over a half million in equipment through the sales of his custom knives. 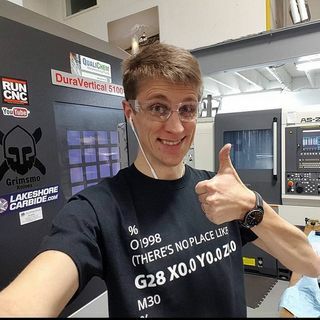 John Grimsmo has shown every aspect of ... Más informaciones growing his CNC business on Youtube. With nearly 50 thousand subscriber and millions of viewers he has brought machining to the masses. Grimsmo Knives created a series of custom made knives that enjoy a large following.